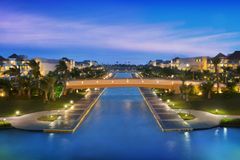 Those travelling to the Dominican Republic looking for fun both on and off the fairways would be hard pressed to find a better base for their golf holiday than the all inclusive Hard Rock Hotel & Casino in Punta Cana. With guestrooms to write home about, endless excellent dining options as well as the best casino in the country, easy access to the local area’s vibrant nightlife and an amazing Jack Nicklaus designed golf course, not to mention a location just a stone’s throw from the beach, this fun loving hotel is the ideal choice for the fun loving golfer heading to the Caribbean. While there are rockstar touches throughout the hotel, on the golf course you come in contact with golfing royalty. Jack Nicklaus, one of the game’s greatest ever players, was charge with the task of creating a golf course that would not be overshadowed by the outstanding hotel which it belongs to. The Hard Rock Golf Club at Cana Bay boasts 18 amazing holes of championship golf and at 7,253 yards from the back tees; it certainly has the guts to provide a challenge to even the best players in the game. Challenging yet accommodating – there are many different tee locations on each hole so that all golfers can find their comfort zone – the course meanders through the beautiful Dominican landscape which is ablaze with the colours of the local flora and fauna. Of course no round of golf is complete without a quick trip to the clubhouse and at Hard Rock Golf Club, the 19th might just be the best hole on the course! When it's time to settle up the bets, or just toast a round well played, there's nothing better than enjoying tasty snacks and ice-cold beverages, all part of the all-inclusive goodness that is the Hard Rock Hotel & Casino experience. The guestrooms at the Hard Rock Punta Cana have to be seen to be believed. Spacious, indulgent and luxurious, these rooms pack plenty of rock star punch as well. Private balconies, hydro spa baths and dual showers are just some of the amazing amenities afforded to guests choosing this hotel and with all the modern touches you’d expect of a 5* hotel, including complimentary wireless internet access, LCD TV with satellite channels and individually controlled air conditioning, your stay is sure to be as comfortable as it is stylish. Dining options at Hard Rock Punta Cana are as adventurous as the rooms. From the very best seafood and traditional Caribbean classics that the Dominican Republic has to offer, to Mexican and Asian-fusion themed menus at the hotel’s many restaurants, there is something to suit every taste at Hard Rock Punta Cana. Throw in the option of In-Room Dining, available 24 hours per day, and you;ll never be too far away from an amazing meal. When it comes to amenities, the Hard Rock really takes some beating in the Dominican Republic. From the relaxing atmosphere of the Rock Spa to the excitement of the Casino, your time away from the fairways can be as relaxing or fun-filled as you like. Tennis courts provide sports lovers with a chance to burn off some steam while no less than 12 swimming pools, many with swim up bars, ensure you always have the opportunity to cool off in the Caribbean heat. A fantastic mini golf course also allows golfers and non golfers alike to brush up on their short game skills before taking to the golf course.